In the previous post we managed to write the output of our VIC-II module to SDRAM. The resulting frame as retrieved from the SDRAM of the Zybo looked pretty distorted, although we could seem some resemblance of the C64 Welcome screen. After I posted the last post, I did some investigation into why the frames get distorted. It turned out that an old bitstream file got stuck in the Xilinx SDK Workspace I used, and exporting new bitstream files from Vivado to this Workspace simply didn't override this old bitstream. Eventually, after some frustration, I deleted this Workspace, created a new a one and exported the bitstream again from my Vivado project to this Workspace. It was only then I had the aha moment: My frame rendered perfectly without any distortions! Well, one less thing to worry about. In this post then I will focus on something totally different. In this post we will get VGA output to work. 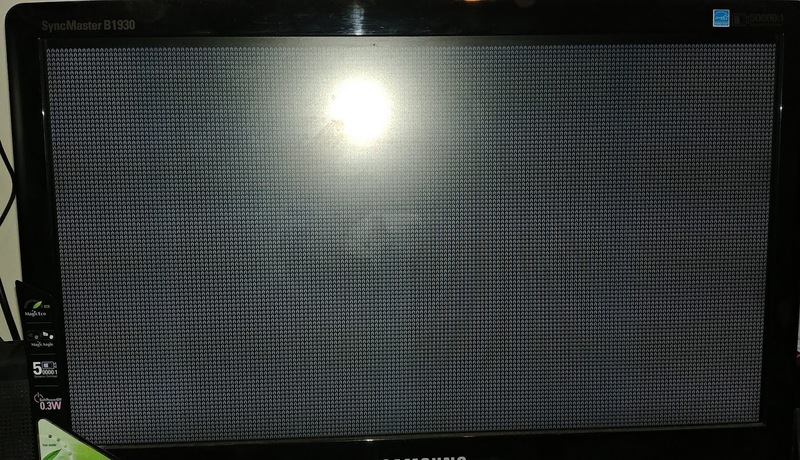 We will, however, not be developing a full solution for displaying the contents of a framebuffer on a monitor, but something simple, which is displaying a screen filled with the character 'A'. When you want to display something on a VGA enabled screen you will spend most of your effort getting to know the meaning of VGA timing parameters. So let us start covering them. The base of all is the frequency of the pixel clock. The pixel clock basically give the pace at which you dish out pixels of your frame to your monitor. The name says it all: One pixel for every clock cycle of the pixel clock. It is important to note that at every clock cycle of the pixel clock will you not only be outputting displayable information. You will also have pixel cycles where there is blanking happening and synchronisation. These terms will become clear in a moment. This graph illustrates a typical video signal. In the centre, Picture information, represent the visible parts of the signal. The two small pedestals in the picture represents synchronisation pulses. A synchronisation pulse basically instructs the monitor to reset the place to draw the next pixel on the screen to the beginning of the next line. These sync pulses ensure that monitor draws the pixels of the video signal to the correct places on the screen. You will notice that this sync pulse is not directly following the picture information, but rather have some padding surrounding it. This padding was added to the cater for the limitations of Cathode Ray Tubes, which was used in the first VGA monitors. Actually calling CRT's "The first VGA monitors" sounds a bit misleading, as if it CRT's was only used briefly as VGA monitors. This is anything but! CRT's have been used for VGA monitors for quite a number of decades. Even in the early 2000's your standard monitor was a CRT. LCD monitors only really started killing CRT's towards the end of 2010. But, let us get back to the point of the discussion: what limitations does a CRT have? Let us start by reviewing how a CRT works. A CRT projects an electron beam on a surface that is coated with phosphor. Where the beam hits the surface, a tiny spot on the screen will illuminate. Thus, to have a picture displayed on the screen this beam needs continuously scan across the whole screen. This is performed from left to right and from top to bottom. The beam is moved around with the aid of magnetic deflection coils. When the electron beam reaches the end of a line, the horizontal deflection coils moves the beam rapidly back to the left to start a new line. During the period when the beam moves rapidly back to the left and resuming scanning from left to right, the beam is not moving at a uniform speed, It is during this period we don't want the beam to draw anything on the screen at all. It is for this reason we need to add some padding surrounding the horizontal sync pulse, so that drawing on the screen can only resume once the beam has reached a steady speed. These padding surrounding the sync pulse are also parameters that needs to be specified for a VGA signal. There is two parameters for this purpose: Back Porch and Front Porch. Front Porch is the period of padding in front of the Sync Pulse and the Back Porch is the period of padding after the sync pulse. In the VGA world, these two parameters is specified in terms of pixels. Horizontal Sync pulse width, also measured in pixels. This is about all there is to VGA timings. Before we can start to develop a FPGA implementation for outputting a VGA signal, we need to first figure the VGA timing parameters to use as discussed in the previous section. For this exercise I am going to use LCD monitor for displaying the signal that has a resolution of 1360X768 @ 60HZ. This is not really a standard VESA resolution that you will find timings for on the VESA website, so I had a bit of a hard time doing Internet searches for finding the parameters. We can apply the same reasoning to our modeline. So, the number 85.875 is the frequency of pixel clock. To understand the rest of the numbers, we should visualise one long line that starts at the beginning of visible data and extends all the way to the end of the Horizontal Back Porch. All the crucial timing elements is then marked as a specific pixel on the line. So, if we start with the first number after the pixel clock. This number, 1360, indicates that pixel number 1360 is the last visible pixel on the line. Pixels after this pixel is part of the Front Porch. The Front Porch pixels carries on till we reach pixel number 1408 (e.g. the number in the list of parameters). At this pixel we enable the Horizontal sync pulse which lasts till we reach pixel 1520 after which the sync pulse is switched off. After the Horizontal Sync pulse is switched off, we are in the Back Porch period which lasts till pixel number 1768. After pixel 1768 we wrap back to pixel 0, and we are at the beginning of the visible area of the next line. The set are numbers following 1768 are related to Vertical Syncing, which follows the same convention as the Horizontal parameters. The only difference is that we specify the Vertical parameters in terms of lines. With Linux modelines somehow demastified, we can now calculate the parameters for use within our FPGA design. The last two parameters in the list, +hsync and +vsync, indicates the polarity of the horizontal and vertical sync pulse. In this case both our sync pulses will trigger a sync action when they are at a logic level '1'. We finally have enough information to start the design of our FPGA module. We currently only have the clock as an input port. Obviously this clock will need to clock at the desired pixel frequency which is 85.875MHz. These counters will synchronise all the functionality within our VGA module. Next, we should generate the actual displayable pixel data. 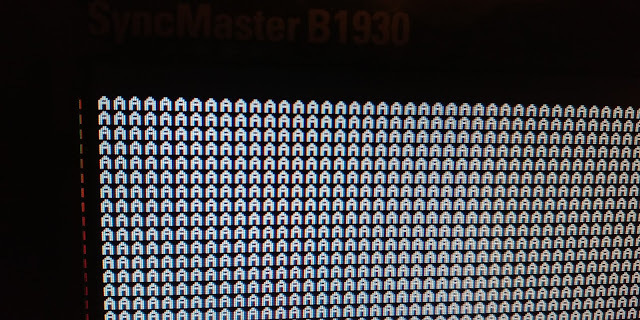 As mentioned earlier, we want to display a screen filled with 'A's. We use the A image contained in the C64 Character ROM, which is an 8x8 pixel image. We will generate the image data in almost the same way as we did with our VIC-II module, which is loading a byte of image data into a shift register and then shifting it out bit by bit for display. We basically break up the visible area in 8x8 cells. When we are at the first pixel of a cell (e.g. bits 2-0 of horiz_pos == 0) we load pixel_shift_reg with the byte value for te applicable row. For the remaining pixels, we just keep shifting out till we get to a new 8x8 cell. So, if we are within the visible area of the screen pixel_shift_reg will tell us if the current pixel at hand should be on or off. Next thing we should do is to map an on/off pixel to a color. Before we can this, we should first find out how color signals work in VGA. To convey color information, a VGA connector provides three analogue pins. There is a separate pin for Red, Green and Blue. An FPGA can only output zeros and ones on its output pins, an ADC (Analogue to Digital Converter) is required to interface with the color pins on the VGA connector. It is quite an interesting subject! We only output a value for out_pixel from our shift register if we are within the visible region, otherwise we just output a black pixel. This concludes our VGA output module. With the VGA output module we need to create an instance of this module and wire up all the ports. We do this by first wrapping this module into an IP Block, which we covered in a previous post. We then create a new block design. In this Block Design we will start by droping an instance of our VGA block. We will also need to invoke the Clock Wizard to create a Block for generating a 85.875MHz clock signal, which will be our pixel clock. We will link up this singal to the clk port of our VGA block. As usual for our Zybo designs, we also need to add a ZYNQ processing block with relevant supporting blocks to our block design. What still needs to be done is to connect the output ports of our VGA block to the pins of the FPGA that leads to the VGA connector. You will notice that each pin of a vector like vga_r, vga_g, vga_b is specified separately. For the Port name, you should specify the same name specified following get_ports in the constraints file. You will need to create a port for each color channel, called vga_r, vga_g, vga_b. Remember to specify the correct vector range for each one (e.g. 4..0 for vga_r/vga_b and 5..0 for vga_g). Luckily you need add only one port per color channel, and not one per pin as performed in the constraints file. 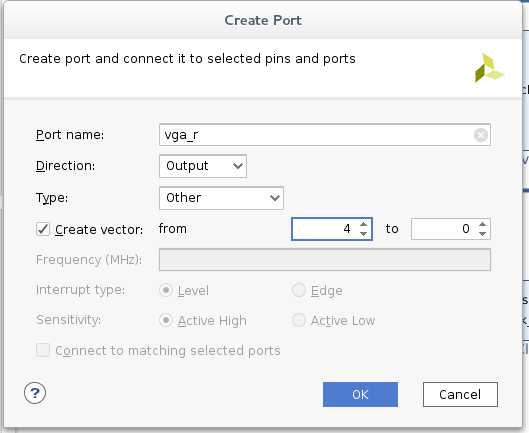 After the color channel ports, you need to create two more ports, vga_hs and vga_vs, which are both single ports. We are are done drawing our block design. We can now continue to Synthesise the design and generating the BitStream file. Once this finished you can export the Bitstream to a Xilinx SDK Workspace and start design on the FPGA as we did in previous posts. The 'A''s are pretty crisp. As mentioned this screen is 1360 pixels wide, so one can fit 170 characters on a line on this screen. There is also a very small margin on the right hand side. For now, however, I not too fussed with the margins. In this post we played around with VGA output using the Zybo Board. 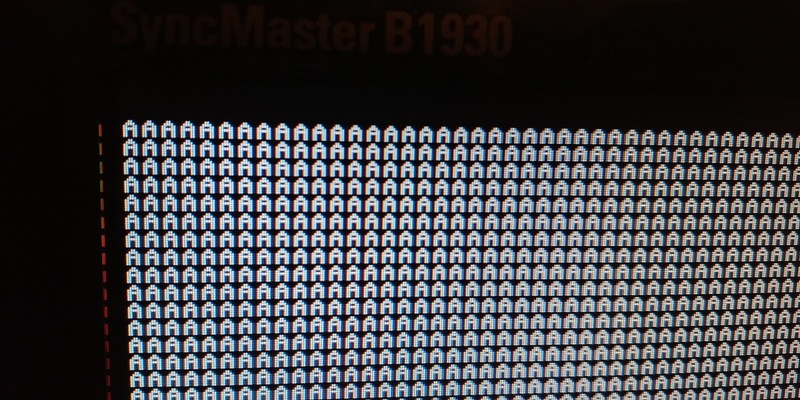 In the end we managed to get a screen filled with A's. In the next post and in coming posts I will start working on functionality for reading back the the frames from SDRAM to our FPGA and then displaying it on the VGA screen.